Even before AVs arrive on our streets, there’s a lot we can do to improve our transportation system today. Photo: Sergio Ruiz. The principal downsides we are concerned with are increasing the amount of traffic in cities and continuing our dependence on cars (and all of the negative consequences that go along with it). Due in part to ride-sourcing services (such as Uber and Lyft) and app-based delivery services (such as Amazon, Postmates and others), traffic in cities is on the rise. With AVs, these on-demand transportation and door-to-door delivery services could become even easier and cheaper to use, increasing their use even more. We don’t yet know the limits of how much on-demand transportation and door-to-door to delivery we can handle on our sidewalks and streets (or in our skies). The adoption of AVs on a grand scale is not inevitable, and their predicted benefits — greater safety, less traffic, fewer regulations — have not yet been proven. As we plan for the transportation system of the future, we should set goals that we will accomplish with AVs or without them. The following are effective strategies to manage traffic and make it easier to get around even if AVs never show up. The priority that threads through them is creating the freedom to move around our cities and region without depending even more on cars. 1. Don’t wait for AVs for safety. Improved safety is the great promise of autonomous vehicles, but we shouldn’t pin our hopes for this basic human need on a future technology. (In March, a pedestrian was killed by an Uber self-driving test car, the first known death of a person due to an AV). People should be able to cross a street in their neighborhood without fear of death. We can and should take steps now to make roads safer — with or without AVs. A lot of faith is being put in AVs to bring safety to our streets, but we already have the tools to eliminate traffic-related injuries and fatalities: speed limits, road diets, protected bike lanes, narrow traffic lanes, automated speed enforcement, pedestrian-only streets — the list goes on and on. 2. Offer mobility to those who need it most. We are still figuring out how to create equality of access in our region. At present, it’s far from guaranteed that those who stand to benefit the most from AVs will — children, people with disabilities or sight impairment, older adults and others who can’t operate cars. In one version of the future, safe and efficient transportation is only available to those who can afford it, with disinvestment from public systems following. The answer to access isn’t to just subsidize people to use private systems. We must resolve to address this challenge by changing who is at the table, designing better public transportation services and safety nets, and regulating private services. We can start designing and prototyping these access solutions today. 3. Design streets for fewer cars, not more. In many cases, a vehicle cap or outright exclusion of cars is the right solution for a given street or district. Variations of “car bans,” such as Oslo’s plan to keep all cars out of its city center by 2019, are being implemented in many cities around the world. Geofencing, the use of GPS or RFID technology to create a virtual geographic boundary, is one way to cap or restrict vehicles. In the future, we can use sensors that communicate with AVs to create dynamic street zones and dynamic roads, allowing the use of the space to change over the course of a day. 4. Manage curbs and their many uses. The curb is the interface between the part of the street that is about mobility and the part that is about accessing buildings or just hanging out. When transportation changes, that interface has to adapt. The curb is a public resource and public asset; its allocation needs to serve the public interest, which can include mobility, commerce, public space, water management or other goals. With conventional mobility, people get out of a private car at the curb and leave it there. Today’s door-to-door and on-demand economy depends on having a lot of space for vehicles to pull over and then keep moving, along with space for slower mobility such as bikes or local transit. If AVs can take up less space and reduce the desire for parking, and even car ownership, we can turn the extraordinary amount of curb space devoted to storing cars into transit zones, delivery and loading areas, parklets and more. Imagining different options for managing curb space is something to start today. 5. Set prices to encourage the conditions we want. A lot of people anticipate that AVs will make the private cost of a car trip lower, leading to more and more driving, which would in turn make the social cost of driving higher. We already have this problem today. One solution to managing an excessive amount of driving is to use the price of driving as a tool to both affect behavior (i.e., to keep too many people from being on the road at the same time) and to help fund better transportation infrastructure and management. If we don’t impose these policies now, it will be even harder to impose them in the future if people become further accustomed to cheap and unmanaged driving, as well as inexpensive (or free) deliveries. There are many ways to price transportation depending on what you want to achieve. In general, we should charge more for driving that causes congestion, vehicles that are bigger and heavier (and cause more damage and pollution), and empty space in vehicles (or, in the case of AVs, totally empty vehicles). Vancouver and New York are both engaged in pricing conversations. California’s recently introduced Assembly Bill 3059 (Bloom, Wiener) would permit four congestion pricing pilots in California. Modeled after Los Angeles’s Go Zones, it’s a step in the right direction. It takes money, and lots of it, to shape a regional transportation system. Our region is already behind — thus the quality of our pavement, the packed BART trains, the parts of our cities without bike lanes. Our ability to get what we want from AVs will require continued public investment in infrastructure: in streets, maintenance and operations, technology, tunnels, stations, power systems and more. Growing private transportation shouldn’t translate into shrinking public sector investment. However, we have a spotty record when it comes to investing in public infrastructure, which is why our public transportation offerings are so far behind those of other nations. AV technology will always have to co-exist with more conventional technology and infrastructure in the Bay Area; we have to plan for diverse transportation technologies. It’s an opportune time to take a fresh look at which infrastructure investments make sense under different technological, funding, political and social scenarios. 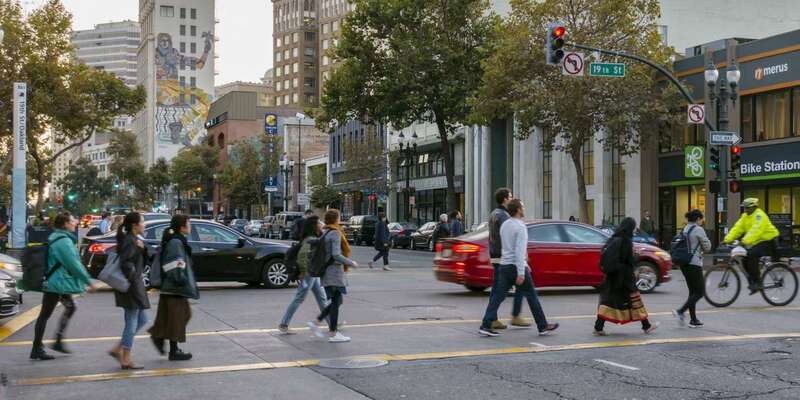 SPUR’s Regional Strategy, San Francisco’s ConnectSF, MTC’s Horizon projects and Resilient by Design are long-range planning efforts leading with this strategic approach. We have yet to develop great projects that leverage driverless technology, such as automating rail or bus lines. Conversely, we don’t want to end up with a lot of AV-specific infrastructure — like new highways and parking towers — repeating the worst of 20th-century urban transportation projects. AVs may also require major investments in all-new traffic control systems — an investment we should consider cautiously. 7. Make public transportation better. Public transportation’s customers have more and more choices of how to get around — and that’s a good thing. But public transit services themselves are also a good thing. With or without AVs, the future of public transit has to be high quality, efficient and desirable. Getting to that goal means adopting a customer-centric focus on knowing who and where your riders — and potential riders — are. The Bay Area’s 28 public transportation agencies have 28 missions for public transportation, 28 business models and 28 different ideas of who public transit is for. Agencies must clarify their missions and markets and undertake business planning that will deliver more for customers. For a variety of reasons, from growing labor costs to growing car ownership, public transit’s business model isn’t working so well. In the not-too-distant future, and long before AVs, we will help some agencies reinvent themselves and offer different services (a challenge, given how regulated public transit is). 8. Develop a very-frequent regional transit network. In studying future scenarios for the region, SPUR has identified a growing need for a high-frequency core transit service that would form the backbone of the regional transportation network. In busy places, we should deliver very frequent transit service so riders never wait more than a few minutes. (This is a realistic expectation. Some Vancouver buses arrive every 4 to 5 minutes, and some Hong Kong subways come every 2 minutes). This would require dedicated bus and rail lanes. In many dense corridors in the region, transit can, and should, be the door-to-door solution. We should define many of these very-high-frequency lines across the region, and they should connect with one another seamlessly. Whether AVs become mainstream or not, we need to invest heavily in transit infrastructure to keep the Bay Area moving without filling cities with cars. Investment is what will deliver frequent service, modern fleets, great stations and a pleasant customer experience. In many parts of the Bay Area, and during many hours of the day, fixed-route transit isn’t practical because there isn’t a steady stream of transit riders at every stop. In these places, we should offer a suite of “flexible transportation” options: on-demand transit, shared bikes and scooters, on-demand shuttles and vans, and shared rides. If AVs can make flexible transportation more convenient and more affordable, more mobility is possible. But we don’t have to wait for AVs — we can experiment with these types of services today. The challenge is to make space for flexible services to pick people up and drop them off while regulating the services for safety and fair access (no easy task). We also need to develop a regulatory structure for flexible services; some flexible transportation will be publicly operated as an extension of today’s public transit, while some will be privately operated. 10. Manage growth, manage sprawl. An oft-cited fear is that AVs will make it stress-free to travel long distances, leading to further sprawl fueled by “mega-commutes.” The answers to the sprawl problem are the same as they have been for decades: Place limits on where urban growth can go while simultaneously making a commitment to compact, walkable places connected by mass transit, using pricing (see above) as a signal to keep people from driving on congested roads or during busy times. The Bay Area has many growth boundaries already in place; that is not the case for much of California. Land use decisions and policies in many cities do not support concentrated growth, and greenfield development remains cheaper and easier than infill development. As long as we build isolated job centers away from transit, we will still require a flood of cars to get people to and from offices. Without growth limits, these patterns will continue, whether fueled by AVs or not. 11. Try pilots, partnerships and experiment. Failing fast and frequently is a hallmark of Silicon Valley. While this credo is not entirely appropriate for government, often the only way to figure out what works and what we can live with is to try things out. Whether through curb pilots, pricing pilots, quick street-redesigns or popup wayfinding, we have so much to learn by experimenting. We also need to start figuring out how to share data between the private and public sectors. And who knows — we might come up with some new transportation solutions people really like in the process. Effective pilots are flexible, have evaluations and data, and focus more on learning than on necessarily solving the problem. The public sector and civic sector don’t need to move at the pace of technology — but they do need to move. Like all new technologies, AVs will lead to unforeseeable impacts and secondary consequences. We might love playing safely in our streets so much that we double down on highway construction to keep AVs separate. Or cities could start building huge parking towers for AV recharging and maintenance. These “what ifs?” (or “what could go wrongs?”) point to significant social, economic and environmental issues and are worthy of more discussion and research. “What if?” is also the question that will lead us to the most desirable outcomes — worlds we are just starting to imagine with entirely new types of transportation networks. Asking “What if?” begs further questions: Who makes decisions about new technology? Whose concerns are heard? Whose common ground are we cultivating? If we’d heeded the warnings of those who foresaw the dangers of automobiles — from pedestrian safety to climate change — when cars were adopted a century ago, we would be living in a different world today. By asking question and developing strategies now, we will be more likely to live in a future that we design — not one that our vehicles design for us.